This Electric Bass is ideal for musicians of any age! Whether you need another Bass Guitar to add to your collection or just need a little something for jam sessions in your garage, this Bass has 20 Frets and a great looking Basswood Body. It includes Gig Bag, Clip on Bass Tuner, Carrying Strap. This bass guitar retails for $299.99. We guarantee you the best price on the internet. 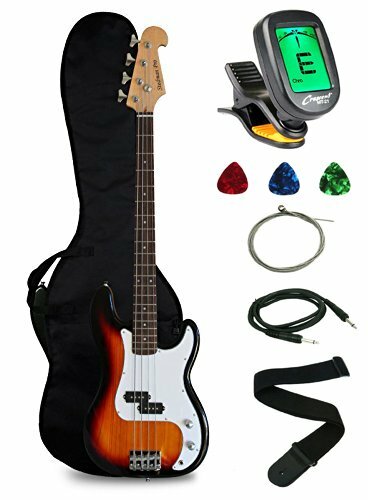 Features: Brand New, 43″ Full Size Electric Bass Guitar, Body: Basswood, Neck: Maple Wood, Frets: 20, Pickups: Split P-B P/U, Regulator: Volume – Tone, Retails for $299.99, Includes Gig Bag, Clip on Bass Tuner, Carrying Strap.